You are here: Home / Nature Journaling / What is a Naturalist? Donna watching hawk migration on Hawk Mountain. Becoming a naturalist can be a journey that lasts a lifetime. I’ve always admired people who could tell you what kind of bird was flying overhead, just by the silhouette. Or how the insects on the yellow flower over there spend their life cycle in a few short weeks. I have been striving toward being that person for most of my life. This online eBook is a guide to “How to be an Amateur Naturalist”. a trained as an Master Naturalist Volunteer and devote much of my time to helping people find and develop a love for the land and all who dwell in her. This eBook includes my thoughts and insights I have gained along the way. For many years I was a self-appointed inspector of snowstorms and rainstorms, and did my duty faithfully, though I never received one cent for it.” (Journal, February 22, 1845-1847). A naturalist understands the land that they live in. They understand the cycle of stars in the night sky and the patterns of clouds that foretell rain. 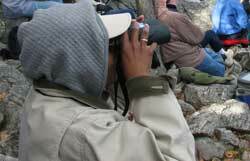 A naturalist spends a lot of time observing. To observe you must be still and quiet in one spot until your presence is forgotten and the animals ignore you and their life resumes. This is when you see the mundane chores of gathering food, courting and raising young. The naturalist needs to observe and identify the plants, animals and minerals around them. The naturalist studies and reads about the habitats and land forms their home is in. The naturalist knows the common plants and animals where they live. The naturalist knows the ecological patterns and processes in their home ecosystem. A naturalist freely shares the information they have learned. Being a naturalist is a lifelong journey. There is always something new to learn and understand. It is never finished and never boring. And final words: Start small, right where you are.